The paint industry is continuously striving to reduce its environmental impact, especially when it comes to the major virgin white pigment, titanium dioxide (TiO2). In this work, recycled TiO2 pigment was used in a paint formulation as a replacement for pigment made from virgin raw materials. The paint was evaluated based on pH, Stormer and ICI viscosities, gloss, hiding power, and color characteristics. The paint films were also characterized by LVSEM–EDS, AFM, and profilometry. The most significant difference between a paint based on recycled pigments and a paint based on virgin pigments was the agglomeration of pigment particles which gave a reduction in gloss and a rougher surface of the dried paint film based on recycled pigment, and it could be concluded that the recycled pigment could not be used without accepting a small decrease in paint quality. This points toward two main directions: (1) the use of recycled pigment in applications with less demand on surface finish and gloss, such as ceiling paints, and (2) that further work on formulation should be carried out with the recycled pigment as for any other new pigment introduced in a paint formulation to optimize its performance. 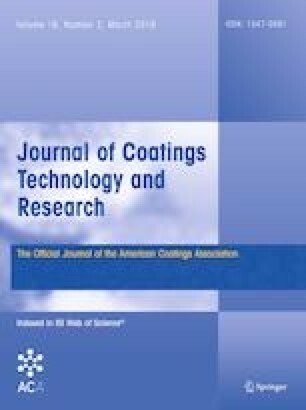 The paint industry is therefore continuously looking for replacements for TiO2 in order to reduce both the cost and the environmental impact of their products.4 One possible source for a replacement of virgin TiO2 could be to recover pigment from waste paint and to make it possible to reintroduce the recycled pigment into new paint formulations in a circular manner. In a previous study,5 TiO2 together with a mix of inorganic extender pigments, mainly dolomite, was recovered from paint through a pyrolysis-based recycling process. The mix of recycled pigments was then substituted in place of virgin TiO2 pigments in two different paint formulations. The paints produced with recycled pigments showed a decrease in important qualities, such as whiteness and gloss, compared to paints made with virgin material. This decrease in quality could be acceptable if it was not for the large aggregates (~ 1 mm in diameter) of TiO2 particles in the dry paint film. Paint formulations are complicated mixtures of many different surface active components making it hard to predict the performance of a recycled pigment in a paint formulation based solely on the characteristics of the pigment. Therefore, this paper presents the results from experiments where the recycled pigment, produced and characterized by Karlsson et al.,6 was used to produce a new paint. The paint properties were evaluated with conventional methods used by the paint and coatings industry with the purpose to evaluate the performance, and to assess the potential use of the recycled pigment as a replacement for virgin pigments in paint formulations. A summary of the pigment properties is given in Table 2. To homogenize the recycled pigment before use, the pigment was milled with a ball mill [RJM 103 from EnviSense (PL)]. Approximately 350 g of recycled pigment (roughly 80 mL) was placed in a 1 L LDPE bottle (outer diameter 95 mm; height 206 mm) with 65 stainless steel balls (8 mm in diameter). The pigment was milled at 300 rpm for 2 h.
The properties of the paint based on recycled pigment were compared to the properties of a standard paint with the same formulation but based on virgin pigment. Properties evaluated on the liquid paints were pH and viscosity in the form of Stormer and ICI viscosity, while hiding power, gloss, and color characteristics were measured on dry paint films. All properties were evaluated using test methods adopted from standard methods commonly used by the paint industry. General information regarding the test methods can be found in Ref. 9, while specific details of methods are given in sections “Test methods used on liquid paints” and “Test methods used on dry paint films.” The dry paint films were also analyzed by atomic force microscopy (AFM), environmental scanning electron microscope coupled with energy diffraction analysis of X-rays (low vacuum scanning electron microscopy with energy-dispersive spectroscopy, LVSEM–EDS) and profilometry. Stormer viscosity was measured in Krebs units (KU) at room temperature with a Krebs unit viscometer (Braive Instruments). ICI viscosity was measured in poise (P) measured using a CAP1000 + viscometer (CiAB Instruments) at 25°C with spindle number 01 at 750 rpm. The pH was measured with a LE 409 pH electrode connected to a FE20 pH meter (Mettler Toledo). The electrode was calibrated daily using a 3-point calibration curve with pH standards 4, 7, and 9 (Labservice AB). Stormer viscosity, ICI viscosity, and pH were all measured 24 h after paint manufacturing. To evaluate shelf life, the paints were stored at 50°C for 5 weeks. After cooling to room temperature, Stormer viscosity and ICI viscosity were measured. An ocular inspection was also made of the stored samples to identify any signs of syneresis (liquid/liquid separation) or settling. Before applications were made for paint film evaluation, the paint samples were filtered through a 125-μm filter to remove possible residual agglomerates or dry paint film. Drawdowns of 150 μm wet film thickness at a speed of 1500 mm/s were made with an Automatic Film Applicator L (BYK instruments) on black and white (Form 10B) checkerboard charts (Leneta Company). The paint films were stored at room temperature to dry, and then, color characteristics, hiding power, and gloss were analyzed. Color characteristics were measured with a CM-600 handheld spectrophotometer (Konica Minolta) in the L*, a*, b* color space10 with Illuminant D65. The color difference between paint based on virgin and recycled pigment is expressed as ΔE*2000, where the virgin pigment is used as Ref. 11. The hiding power of the paint films was measured, as the ratio of the reflective tristimulus Y (CIE) over the black and white parts of the Leneta chart, using a chroma meter (Konica Minolta CR-300). Both colorimeters used were calibrated to substrates with known color coordinates. Gloss of the dry paint films was measured at angles 20°, 60°, and 85° with a micro-TRI-gloss (BYK Gardner). Before each measurement, the instrument was calibrated against the integrated standard that comes with the instrument. In addition to the drawdowns, the paints were also applied with a roller (Elite roller set, Anza) for wall and ceiling applications, on a black Leneta sheet. Both paints were applied with a calculated wet film thickness of 200–300 μm in two layers. Paints rolled on black Leneta sheets were cut with scissors to a size of 10 mm by 10 mm and deposited on carbon tape. The samples were then observed with a FEI Quanta 250 LVSEM operating at 12 kV and pressure of 70 Pa. The LVSEM was also coupled to an Oxford Instruments energy-dispersive X-ray spectroscopy (EDS) detector, under the same conditions. Elemental analysis was done on each sample at 2 different positions by area scan (700 × 400 μm). Nanometer-scale lateral resolution images of surface topography and surface nanomechanical properties were obtained using an atomic force microscope, Multimode, Nanoscope V (Bruker®, Santa Barbara, CA), operating in PeakForce® QNM mode. A silicon nitride cantilever, ScanAsyst-Air (Bruker®, Santa Barbara, CA), was utilized for all experiments. PeakForce® Quantitative NanoMechanics (PeakForce® QNM) is an atomic force microscopy mode that provides high-resolution topography imaging and nanomechanical properties such as adhesion and dissipation.12,13 In this mode, the scanner oscillates in the normal direction with a frequency in the range 0.5–4 kHz. While scanning, the AFM feedback loop keeps the chosen applied force constant (peak force) by correcting the overall extension of the piezo. A force curve is obtained with every tip contact, and its analysis provides the nanomechanical properties which are displayed in the images. The possibility to apply and control very low forces (piconewton range) leads to nondestructive imaging. Drawdowns of the wet paint were made using a 90-µm film applicator on freshly cleaved mica and allowed to dry 24 h at 23° C and 50% RH before observation with AFM. The surface texture of the rolled paints was measured using a stylus instrument (DektakXT stylus profiler from Bruker), a contacting technique. A diamond tip with a radius of 2 µm was drawn 10 mm over the surface at a speed of 0.11 mm/s. The distance between each sampling point was 0.37 µm. The force on the tip was set to 0.1 mg. The vertical scan range was set to 524 µm with a vertical resolution of 8 nm in this work. In this section, the results of the measurements for the paints based on virgin and recycled pigments are presented. In general, the results of the absolute measurement values are of minor interest, while the relative difference between the two paint samples is of major importance. Both paint samples (using recycled and virgin pigments, respectively) yielded the same measured pH value of 9.1 ± 0.1. This falls within the range of what was expected for an emulsion paint. The recycled pigment did not show any impact on the pH of the paint. The results from the viscosity measurements can be found in Table 3. There was a slight variation in the ICI viscosity, but the differences were too small to have a relevant impact on the paint. The difference in Stormer viscosity between the samples before storage, 110 KU for virgin and 104 KU for recycled pigment, is not substantial but may be noticeable for a professional painter. However, the difference in Stormer viscosity may be corrected by adjusting the thickener concentration in the paint formulation. Both samples show a slight decrease in Stormer viscosity after storage. It is not unusual to get slight changes in viscosity after stability testing. Major changes in viscosity, syneresis, or gel formation would be a reason for concern, but none were observed for the paint samples presented here. The color coordinates for the two paint films are presented in Table 4. The color difference between the two films is summed up to ΔE2000 = 0.51. This difference is on the limit of what the human eye can detect,9 and for many practical applications, this difference is acceptable. The recycled pigment gave a slight decrease in hiding power compared to the virgin pigment as shown in Table 5. This, combined with the significant decrease in gloss (Table 5), suggests that the recycled TiO2 was aggregated, thus not having the right particle size distribution for optimum light scattering. The particle size measurements that were made previously6 did not suggest that the recycled pigment was more aggregated than its virgin counterpart. However, before these measurements were taken, ultrasound was applied to the pigment suspensions and the measurements were taken on a small sample size (< 0.1 wt% of the total amount used to produce the paint). Surface characterization of the pigments6 did not indicate any major differences in surface chemistry between the pigments. Furthermore, the properties of the paints after the stability test (Table 3) do not suggest that there was a problem with the colloidal stability of either paint. Therefore, the most likely reason for aggregates in the paint based on recycled pigment is the pigments aggregated during the recycling process. The shear forces in the milling of the paint during manufacturing were not sufficient to de-agglomerate the recycled pigment. SEM micrographs for paint films using virgin and recycled TiO2 pigments are shown in Fig. 1. A comparison of the micrographs revealed a substantial difference between the paint based on the virgin pigment and the paint containing the recycled pigment. Paint film using the virgin pigment (Fig. 1a) is rather smooth, whereas Fig. 1b confirms the formation of aggregates in the paint made with recycled pigment with the largest aggregates being approximately 100 µm in diameter. For both paint films, three major components were detected (C, O, and Ti) in the EDS analysis. The average atomic ratio of the paint film based on virgin pigment was 48% C, 40% O, and 10% Ti, while the paint film based on recycled pigment had an average composition of 51% C, 39% O, and 10% Ti. This leads to the conclusion that there was no significant difference between the paints regarding the atomic composition or spatial distribution of the atoms. 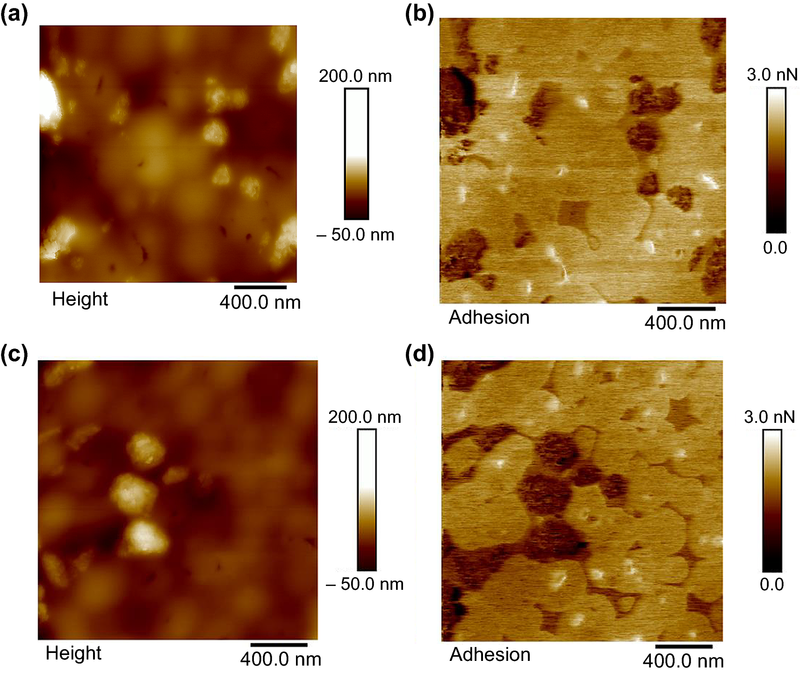 The microstructure and adhesion were investigated by AFM using a PeakForce QNM mode on the paint film surface for paints based on virgin and recycled pigments as shown in Fig. 2. From the height images (Fig. 2a and 2c), little difference could be observed, except maybe a slightly rougher character in the case of the films based on recycled pigment. The topographic images are slightly blurred; this is most likely due to the thin layer of surfactant covering the surface of the paint films as suggested by the adhesion micrograph (Fig. 2b and 2d). Below the surfactant is the more adhesive latex film (data not shown). This was expected considering the paint formulations were the same except that the pigment was changed. Interestingly, no difference could be seen for the adhesion pictures (Fig. 2b and 2d). The dark areas correspond to low adhesion in the adhesion images. These areas are likely to be the TiO2 pigment which appears (on this length scale) to be well distributed throughout the paints. The surface structure and roughness of the hand-rolled virgin pigment- and recycled pigment-based paint films are shown in Fig. 3. Compared to AFM, profilometry looks at a larger scale, more relevant for the visual appearance of the films. For both paint films shown in Figs. 3a–3b, the surface structure was fairly rough with hills and valleys up to 100 µm apart. Both types of paint show a long waviness profile which comes from the application method of using a hand roller aimed at producing this effect. The finer waviness (noise) referred to as roughness is shown in Fig. 3b for the recycled pigment-based paint film but is absent on the surface profile of the virgin pigment-based paint (Fig. 3a). The separation of waviness from roughness was achieved using Vision64 version 5.51 update 2 software. The primary profiles for each paint from Figs. 3a–3b were filtered so that waves longer than 0.5 mm (called waviness) were removed, while waves shorter than 0.5 mm (called roughness) were displayed. The filtered profiles are shown in Figs. 3c–3d for virgin pigment- and recycled pigment-based paints. It becomes clear that the roughness of the paint with the recycled pigment is much larger than that of the virgin pigment. However, the surface structure of the application method is more dominant to the overall paint structure than the contribution of the aggregated pigments. This, together with the size of the aggregates (see Fig. 1), makes the agglomerates hard to detect for an observer at a distance beyond 30 cm from the paint film. Two paint formulations were compared in this research. One paint formulation was based on virgin TiO2 pigment as received from the supplier, while the other paint formulation was based on recycled TiO2 pigment. All other paint components were kept constant in order to compare and evaluate the performance of the recycled TiO2 pigment when compared to the virgin TiO2 pigment. The Stormer and ICI viscosities as well as the pH were measured on liquid paints. There were no significant differences in pH or ICI viscosity between the paints based on either virgin or recycled pigment. The liquid paints only showed a small difference in Stormer viscosity, which was deemed acceptable and could be adjusted by the addition of a thickener. The dry paint films were evaluated based on the color difference, hiding power, and gloss. The slight difference in color between the two paint films is insignificant for most applications. However, the paint based on recycled pigment had a lower hiding power than the paint based on virgin pigment. One of the main reasons TiO2 is used as a pigment is due to its ability to produce white paints having a very good hiding power or ability to scatter light. Even though there is a slightly lower hiding power for the paint based on recycled pigment compared to the virgin pigment, it is the reduction in gloss that is the bigger issue. The reduction in gloss turns the formulation from a glossy (virgin pigment) to a mid-sheen formulation (recycled pigment). The surface structure and morphology of the dry paint films were also analyzed using AFM, LVSEM–EDS and profilometry. The presence of aggregates was visible in the drawdowns. A previous study,6 showed no significant difference between virgin and recycled pigments in particle size or surface characteristics. It is, however, impossible to rule out that minor alteration has occurred at the surface of the recycled pigment in terms of surface chemistry. This alteration would play a role when it comes to the interaction with the surface active components of a paint leading to aggregation, for instance during film forming. This observation also suggests that the formulation of paint should be tuned toward the use of recycled pigment, as for any other pigment. It should also be mentioned that, due to the rough surface, the durability of the paint film based on recycled pigment could be reduced compared to when using virgin pigment. Even though the recycled pigment gives a quality decrease, its use remains largely possible. In certain applications, this drop in performance can be acceptable. When the paint containing the recycled pigment was applied with a roller, it was very hard to identify the agglomerates due to the topography of the rolled paint. Furthermore, the gloss of the formulation based on recycled pigments was higher than that on most wall and ceiling paints, so an extender pigment would be needed to reduce the gloss even further. This means that the recycled pigment might be of greater value in formulations with lower gloss or sheen, which is one of the currently developing trends in the global decorative paint market. Additionally, the paint based on recycled pigment could be applied to rough surfaces, such as a mineral substrate, without any problems. One other application for the paint could be surfaces that usually do not get scrutinized carefully, such as ceilings. In the formulation presented in this work, 100% replacement of virgin pigment with recycled pigment was done. A smaller replacement would most likely have less impact on the paint properties. If the recycled pigment is not used as a replacement for TiO2 pigment in a high gloss paint formulation, it could be used as a so called extender or filler pigment. Extender pigments are used to reduce gloss in, for example, formulations for wall and ceiling paints. Here, the recycled pigment would have the benefit of reducing gloss without the trade-off in reduced whiteness or opacity which is normally associated with more traditional extender pigments. Overall, the results of the present investigation show that it is possible to recycle TiO2 pigments from paint waste, with minor effects on the appearance. However, the gloss and covering power of the recycled pigment were lower than those of paint made with the virgin pigment due to pigment aggregation. Agglomeration could probably be mended by further work on formulation, which is expected to be done as for any new pigment product. The performance of the recycled pigment was deemed as clearly promising by the paint industry which motivates further development in the field. The authors acknowledge financial support from the Swedish Governmental Agency for Innovation Systems (Grant number: P37547-1), Akzo Nobel Decorative Paints, UK, and Stena Metal AB, Sweden. Work was partly financed by scholarship granted from the Swedish Paint and Printing Ink Makers Association and the Swedish Adhesive and Sealants Association. The authors would especially like to thank the personnel at Akzo Nobel Performance Additives SE for their support.